One of the things I love about the Italian language is the many unique words that describe similar, yet subtly different, things. Take soup for example. Zuppa. Minestra. Minestrina. Minestrone. And those are just the common words for soup. So what is the difference? Zuppa is often used as a generic word for soup and because it sounds like the English word, it's what many of us remember. To be more precise, a zuppa is a broth-based soup often served over bread. Think zuppa di pomodoro (the best tomato soup you will ever eat) or zuppa di pesce (a fragrant fisherman's soup). Zuppa is not thickened except by the bread, so no beans or pasta here. Minestra is a more important soup and the word has deeper cultural significance. Marcella Hazan, in her book "Marcella Cucina," describes minestra in this way: "When Italy was a poor country, minestra signified more than a dish - it was, for most of its people, the whole meal. Minestra was synonymous with survival." There are two common variations on the word minestra. In Italian, the ending "ina" is a diminutive, so a minestrina is a "little" or light soup. Minestrone on the other hand is a big soup ("one" = big in Italian), thick and hearty and chock full of veggies, beans and pasta. 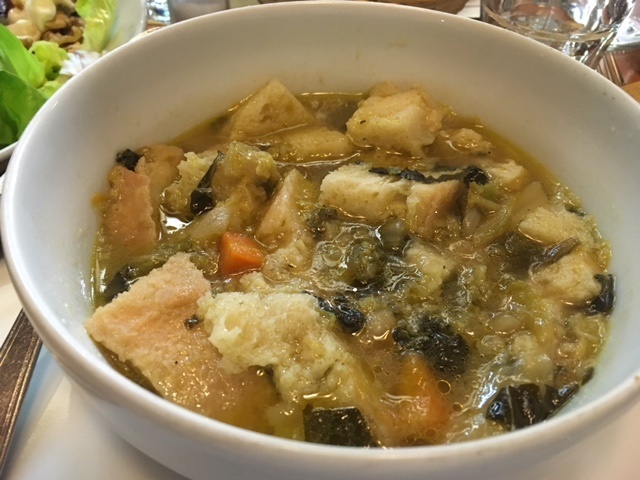 When I was in Italy in January of this year I made a minestrone that chased away the cold weather and enticed me all afternoon with it's wonderful aroma. Because today is a cold day here in New Mexico, and I'm thinking of how good that pot of soup was on a similarly cold day in Italy, I've decided to make a minestrone for dinner and thought I'd share my recipe. This recipe makes a really big pot of soup (6-8 servings). The recipe can easily be cut in half and you can experiment with the ingredients - if there is something you don't like, omit it or replace it with something different, substitute chicken or vegetable broth for the beef stock, omit the pancetta for a vegetarian minestrone, and if you like a thinner soup, just add more water. Make it your own! Heat olive oil in a large heavy-bottomed soup pan. Add pancetta and stir until it begins to look cooked but do not let it get crisp. Add onions and garlic; sauté on medium low heat until onions are translucent. Add carrots and celery; sauté for another 10 minutes. Stir every few minutes. Add chard, red potatoes, tomatoes, beef stock, thyme, salt, pepper, bay leaf, and Parmesan rind. Bring to a good simmer. Reduce heat, cover loosely and simmer on low for 1 hour, stirring occasionally. Add cabbage and beans, cover loosely and return to simmer on low for 1 hour. If adding ditalini, add in the last 20 minutes to avoid overcooking the pasta. Add more water as needed as this soup gets very thick. To maintain flavor, you can add 1 beef bouillon cube for every additional cup of water. To serve: drizzle each bowl with some good quality extra virgin olive oil and a few grinds of black pepper. Top with grated Parmesan and a piece of toasted bread if desired. The finished minestrone - delizioso!